Yesterday, Jerry Stritzke attempted to capitalize on Internet buzz around his decision to close all stores on Black Friday, taking to Reddit to participate in one of their popular Ask Me Anything threads. I enjoyed being on Reddit. It’s an incredibly passionate and engaged community. I value and encourage transparency from the people who work with me and the people whose lives we touch. 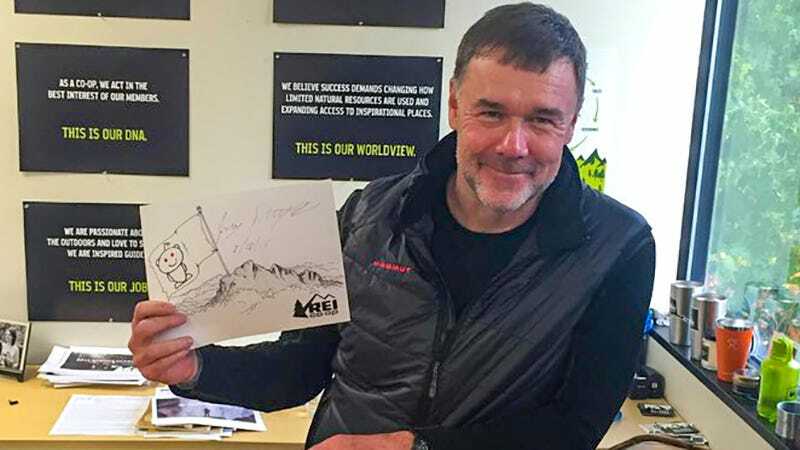 We do a huge number of things at REI to engage with employees and drive transparency and so discussing things like what it means to be a membership organization are normal practice. That’s vital because our members are actually the owners of REI. About the Reddit thread specifically – this is a completely legitimate conversation (how we invite people to join the co-op and how we measure employee performance). It’s an issue we’re currently focused on and so I plan to dig into the question more deeply. We will have a collective conversation about this issue. This will include conversations in our stores. If I’m not happy with what we find, we’ll make a change. Bottom line, though, an open and transparent conversation is something CEOs should not be afraid of. I, for one, welcome it. It’s the morning after Thanksgiving, and you walk through the silent aisles of a closed for the day REI. Your tummy is full of the turkey your wife so excellently cooked on a MSR wisperlight. You prop your hand up on you sides and think to yourself, “ By god Jerry, we did it… #optout worked...” But no, I’m there, /u/buttmonkey1120… with black diamond crampons strapped to my feet and a used camelback bladder in my hands. I have red eyes, like those of a crazed black friday shopper. You know I will ruin #optout black friday for everyone unless stopped. I have to start with the Black Diamond Ice axe!! I think I would also go with crampons. I’ve been trying to get an interview at REI for about three years now and have been unsuccessful. I’ve applied online numerous times, networked with REI BPs and Store Managers on LinkedIn for similar advice, and have delivered a resume in person here in Denver to no avail…may I send my resume to you? And believe it or not, Jerry says yes! You may reconsider applying when you re-read this AMA from the top today. Over the course of a year, I received top marks in my check ins, was eventually cross trained in every department, helped out with inventory preparations, stayed overnight to assist with store moves, and trained new batches employees in multiple departments. For a brief time my membership sales stagnated, but my quality of service and product knowledge continued to excel. It was like somebody flipped a switch. I was denied a promotion because I did not sell enough memberships. I had my hours cut from 30 hours a week to less than 10 because I did not sell enough memberships. Additionally, I was not allowed to pick up shifts from people that didn’t want to work because I did not sell enough memberships. Similar things happened to some of my most authentically qualified co-workers as well. Finally, after moving across the country with the assurance of a transfer, I was told by the store in the new city that I did not sell enough memberships and therefore they did not have any room on the payroll for me. I was not even given the courtesy of an interview with the store to assess any of my other skills, just a brief email wishing me good luck. I lost my health insurance, a source of much needed income, and any potential co-worker friends in a new city where I knew no one. And it doesn’t look like annonemp is alone. And there’s hundreds of similar examples, but you get the idea. Stritzke went on to respond to other softball questions, but ignored the concerns of anonemp and others related to working conditions at the national retail chain. Redditors pressed him to answer. Annonemp - First, I want to reiterate that I wasn’t avoiding your question. This was my first AMA and I answered as many questions as I could in the time I was online – clearly the conversation kept on after that. I’m certainly concerned about your experience and to hear others express the same. Our members and customers are our first priority and providing them with knowledgeable insights is the most important thing we do. I believe that this expertise and a shared passion for the outdoors are our overwhelming strengths as an organization and am very proud of the men and women wearing green vests in our stores. I have to admit the emphasis on membership sales was a surprise to me when I joined the co-op two years ago. Given that I was new, I wanted to have a better understanding of the co-op structure and some of the whys behind our actions. There is no doubt that the co-op structure is focused on the concept of membership and there is long institutional memory reinforcing the idea that we should encourage as many people to join the co-op as possible – we believe in the mission and purpose of the co-op. Having said that, we may have lost sight of the bigger picture. The truth is that we should have been doing a better job sharing what makes the co-op special. We should have a “pull” model (people want to join because they believe in our mission and they love the experience), not a “push” model when it comes to the co-op. And the most important thing is that our employees in our stores know that their skill, deep outdoor knowledge and customer service are the things that matter above everything. To be clear, that is how our people should be measured. I feel like your story represents a measure of individual performance taken to an extreme and I am committed to understanding what happened. I appreciate you sharing your story and I assure you that we are looking into how we are using this measure. Good conversation. As of the time of writing, the thread has 3,208 comments; Stritzke has stopped responding. We’ve requested comment from REI and will update when we hear back. “Please support local, authentic, outdoor retail,” says /u/annonemp in his update thanking the community for support.